Wilhelm (II. or IV. ), Duke of Sachse-Weimar, son of Duke Johann of Sachse-Weimar, was born in the castle of Altenburg, April 11, 1598. He studied for some time at the University of Jena, devoting himself especially to music and mathematics. 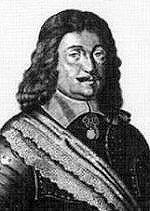 On the outbreak of the Thirty Years War he espoused the cause of Friedrich V. of the Palatinate. At the battle of the Weisse Berg, near Prague, he was severely wounded, and at the battle fought near Stadtlohn, in Westphalia (Aug., 1623), he was at first left for dead, and then taken prisoner by Tilly. In 1625 the Emperor allowed him to go free, and he assumed the government of Weimar. When Gustavus Adolphus came to Germany (1630), Wilhelm did not join him till after the battle of Breitenfeld (Sept., 1631), and in July, 1635, he was one of the consenting parties to the Peace of Prague between Saxony and the Emperor, in consequence of which the Swedish troops made various inroads on his territory. When the final partition took place, in 1644, between himself and his surviving brother (Sachse-Weimar fell to Wilhelm, and Gotha to Ernst) he set himself earnestly to restore prosperity and godliness in the regions under his rule. He also found more time (especially after the peace of Westphalia, 1648), to devote to his studies in poetry and music, and to the adornment of Weimar. He died at Weimar, May 17, 1662 (Koch, iii. 110; Wetzel, iii. 426; Bode, p. 172, &c). Wilhelm joined, in 1617, in founding the Fruitbearing Society, the great German Literary and Patriotic Union of the 17th century; and, after the death (1650) of Ludwig, Prince of Anhalt-Cöthen, became its head. Weimar thus became the centre of its operations, in the direction of which the Duke was assisted by Georg Neumark. Neumark, in his Palmbaum, 1680, p. 449, speaks of the Duke as having "composed several hymns, as well-known in this place, especially the short Hymn of Peace ‘Gott der Friede hat gegeben.'" 1. Lord Christ, reveal Thy holy Face. In full by J. C. Jacobi, in his Psalter Germanica, 1722, p. 42 (1732, p. 69). Repeated as No. 322 in pt. i. of the Moravian Hymn Book, 1754 (1886, No. 724), and as No. 54 in J. F. Thrupp's Psalms & Hymns, 1853. 2. Lord Jesu, to our prayer attend. This is a good and full translation by A. T. Russell, as No. 12 in his Psalms & Hymns, 1851. 3. Lord Jesus Christ, be present now! This is a good and full translation by Miss Winkworth, as No. 13 in her Chorale Book for England, 1863; repeated in the Pennsylvania Lutheran Church Book, 1868, No. 49. 4. Christ Jesus Lord, to us attend. In full by L. Heyl, as No. 3 in the Ohio Lutheran Hymnal, 1880.